An old 17th century road from Newcastle called the King's Highway passed through Bays Leap estate to the north of the village, then via the Hassock and Green Lonnen westward to the Ironsign, an old Inn and halting station now on the Military Road west of Rudchester. The place is still called Iron Sign today. The Whitchester Directory of 1851: "Wm. Hind, Victualler, Ironside Inn" is probably an error for Ironsign. 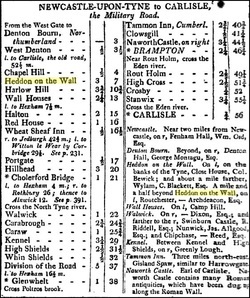 After the construction of General Wade's Military Road in 1752, and the improved Hexham Road, the stage coaches with their patriotic names passed through Heddon. The 'True Briton' left Newcastle at 7am, and the Mail Coach at 7:30am daily, bound for Carlisle, both returning the following day. The 'British Queen' plied daily between Newcastle and Hexham and numerous carts carrying lead ore from Allendale were a common sight. Outlying villages were visited regularly by travelling drapers and provision merchants and met the needs of most people. 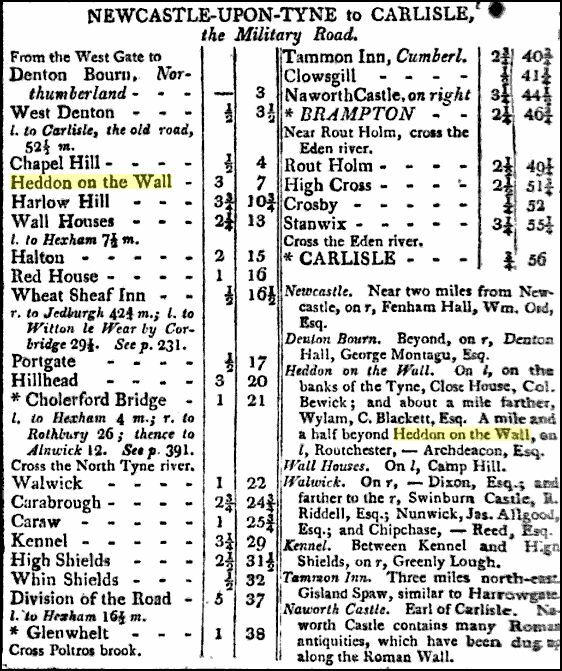 Heddon had a local carrier, David Gibson (Heddon to Newcastle). All drowned in crossing the Tyne on 26th March 1877. 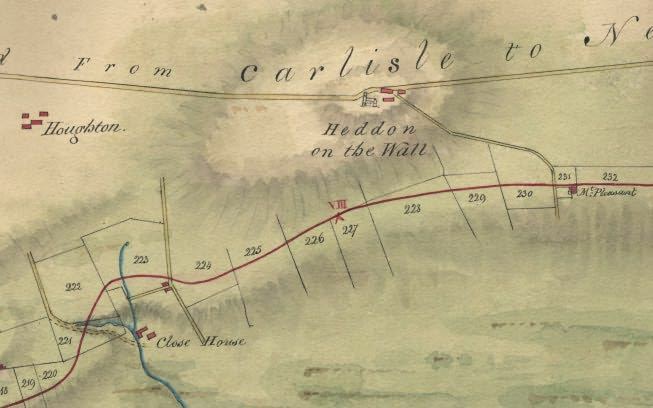 The opening of the railway branch line from Scotswood to Heddon and Wylam along the north bank of the river in July 1885, spared Heddon people the hazardous trip over the river, although still entailed the steep climb to the village. The advent of bus services in the early 1920s brought a much diminished use of the trains and eventual closure of Heddon Station which was finally demolished in October 1959. A regular bus service first started in the early 1920s run by Emmerson Brothers and later incorporated ino the United Bus Co. Newcastle Corporation also plied Heddon with their Blue Bus service for some while. Mention must also be made of the AD122, Hadrian's Wall Bus, which passes through Heddon daily in each direction, allowing access to the full length of the Roman Wall National Trail. Heddon did not lag behind the times in the new motoring age. The site of the service station was previously occupied by a large building serving as a repair garage during the 1920s. After changing hands a few times this project apparently did not flourish and was finally abandoned. The present Service Station came into being in 1931. Late 1890s cast-iron milepost, Heddon on the Wall (2011). Photo by A. Curtis. Stone milepost possibly dating from 1757, Heddon on the Wall (2011). Photo by A. Curtis. 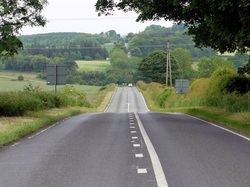 The milepost on the left is on the north side of the B6528 where the road to Throckley crosses Great Hill, east of Heddon village. It is a cast-iron shield with raised letters and arrows which would once have been painted black on white. This one shows the distance to Newcastle 7 [miles] and Hexham 13 1/2. It is the same post illustrated in Keys to the Past which, however, confuses its location with that of the older milepost shown on the right. 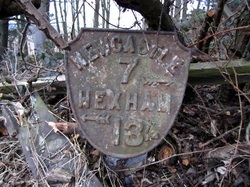 The next milepost of this type west on the Hexham Road is also still extant, in the hedgerow on the north side of the road just west of Houghton North Farm. However, at some stage in its life it has lost its upper shield and the distances had been painted on the flat base plate. This one is also recorded on Keys to the Past. From 1767, mileposts were compulsory on all turnpikes (toll roads), not only to inform travellers of direction and distances, but to help coaches keep to schedule and for charging for changes of horses at the coaching inns. The distances were also used to calculate postal charges before the uniform postal rate was introduced in 1840. At the height of the turnpike era (from 1706 to the 1840s) there were 20,000 miles of roads with milestones. The stone milepost shown in the right hand photograph above is an older design and just bears a single engraved numeral, also indicating 7 miles from Newcastle. The greenish deposit around the number may indicate that it once had a metal inlay. It is located on the course of the old road to the north of the village (now only used for local access), partly built into the high wall which surrounds Town Farm. Its location is shown on the 25 inch to a mile OS map from c1860, and as 'old milestone', on the later maps of 1897 and 1920. On the map of c1897, it had been superseded by the new metal milepost (shown above) situated about 1/4 mile east, although apparently still 7 miles from Newcastle. A similar model bearing number 8 can still be found on the west side of the Military Road between Heddon and Rudchester. There is a recent photo of it here. Old maps show that milestone 9 was just past the road junction at Iron Sign and milestone 10 near the road to Whitchester, shown here. Similar mileposts from further west along the B6318 have been listed, and thought to date from 1757 (the opening of the turnpike). They are described as segmental-topped sandstone, 0.65 metre high, originally painted white with incised figures painted in black, giving the distance to/from Newcastle, . See for example milestone 19 and milestone 20..
Paterson's publication on the principal roads (1811) indicate that distances were measured from Newcastle's West Gate (see figure below). The difference in location of the two types of milepost is maintained to the west as another old milepost is shown on the map just west of the North Lodge of Close House, west of the metal shield type nearer Houghton. Of this, only a short stub remains. 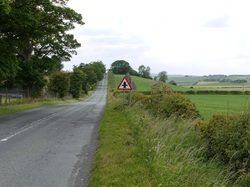 Built on the orders of General Wade following the 1745 Jacobite Rebellion, the road between Newcastle and Carlisle was funded by the government at a cost of around £20,000 but maintained by tolls as a turnpike. Construction began in 1751 and the road completed in 1758. The eastern part of the road was built on the line of the Roman Wall which was largely broken up to provide a source of stone. It was intended as a means to rapidly deploy troops across country. The original route eventually became the B6318. Observations on canals and railways by William Thomas & Barrodall Dodd (1825). The first proposal, by Ralph Dodd in 1794, was for a broad canal to Hexham on the south bank of the Tyne. This would be the first section of 'an inland navigation from the east to the west sea'. In the following year, William Chapman surveyed an alternative route high above the north side of the river, after which followed two years of arguments over the different routes. 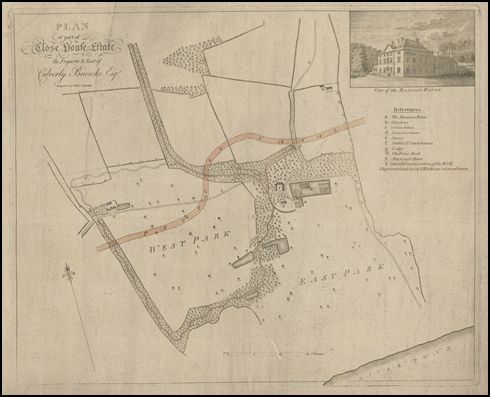 A plan of part of Close House estate drawn up by Beilby and Bewick around 1794 shows the canal north of Close House mansion house. I had considered that this could be the explanation for historical sources that refer to an 'ornamental' canal proposed for the grounds, but a linear water feature is shown in West Wood just south of the ice house on the 1:2,500 OS map of c1859, although it may have been never built. In 1797 a Bill based on Chapman's plans reached the Committee stage in the House of Commons before being withdrawn due to the strength of the opposition, based largely on cost. A railway was built between Newcastle and Carlisle instead, mostly on the south bank route originally proposed for the canal.